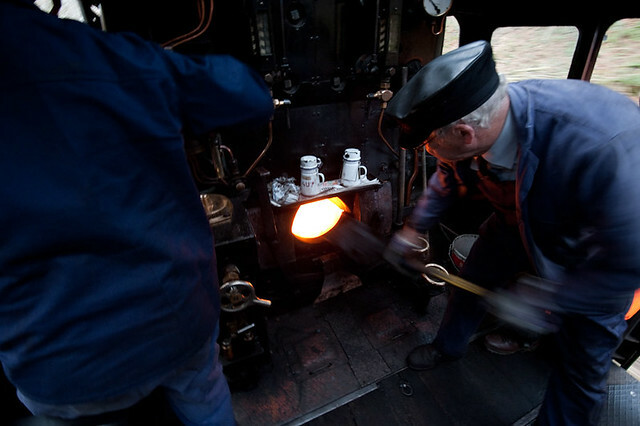 I’d never been on the footplate of a loco before (well, certainly not a moving one anyway), so when I was offered the opportunity, I really couldn’t turn it down!! “Get your super wide angle on and see what you can do!” was the suggestion from Nigel, who had helped put the charter together. Now I no longer have the 14mm Sigma that served me well, but was ultimately let down by some optical flaws, most notably its tendency to flare in almost any lighting condition other than heavy fog. However, the 16-35mm I replaced it with is a far superior lens, even if its field of view isn’t quite as wide. That said, in the relatively tight confines of a Standard 5 cab, every little helps, and I had to stand with my back right up against the tender to get the most out of it. Putting photography aside, it was great fun, and great to see exactly how much activity goes on in making a steam loco move! Feeding the fire. We were actually going downhill back to Bury from Ramsbottom, so the engine wasn’t working too hard, and didn’t need much extra coal. I used a slow shutter speed to accentate the movement, which was a bit of a risk as it’s not the smoothest ride in the world. This was about the only one that came out, and as opportunities were limited due to the relative lack of activity, I suppose I’ve got to be happy with what I’ve got!!! This was very pot luck – I just held the camera over my head and pressed the shutter release to see what would come out. In the circumstances, it’s not too bad.